Recess-It® niche products are produced of a corrosion resistant alloyed aluminum with an elastomeric-waterproofing and anti-fracture coating combined with an aggregate bonding base. 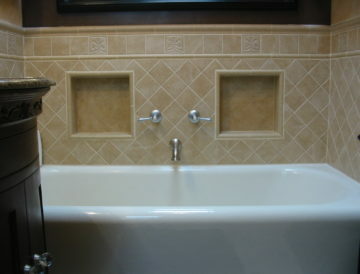 Finished materials, ceramic tile, marble, granite, etc. 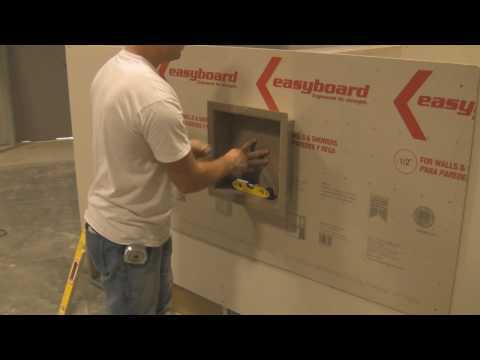 can be applied immediately after product installation utilizing standard mastics or thin-set. 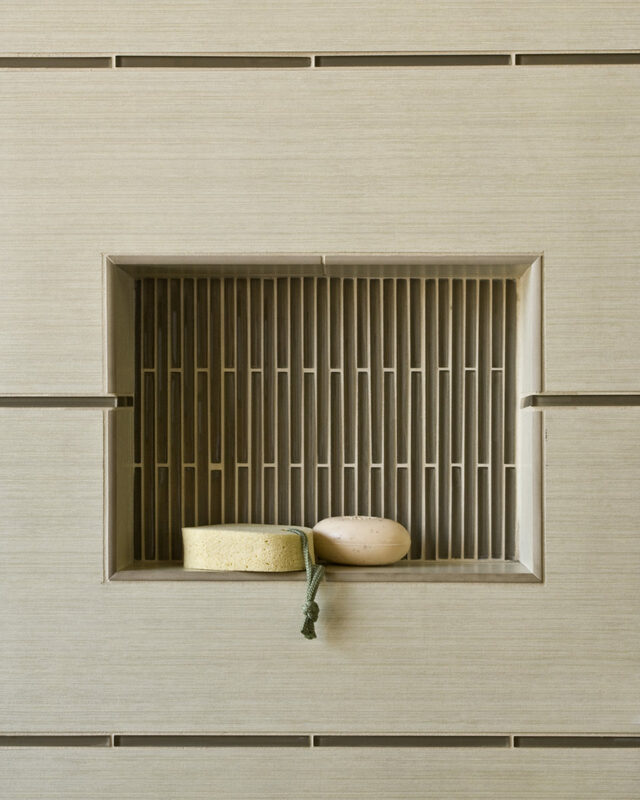 Listed niches are supplied with wall fasteners which may be used with/without preinstalled wood blocking. 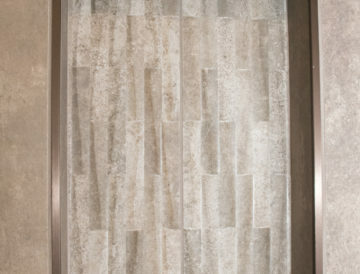 One of the unique features of the Recess-It niche products is the predetermined slope on all four sides, allowing the units to be installed vertically or horizontally! 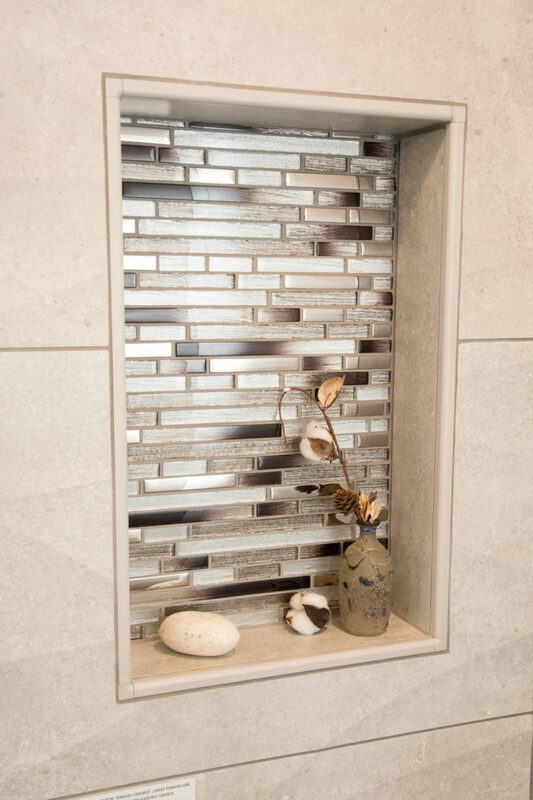 As seen below, this gives the homeowner more design options, therefore making their shower stand out as one of a kind! 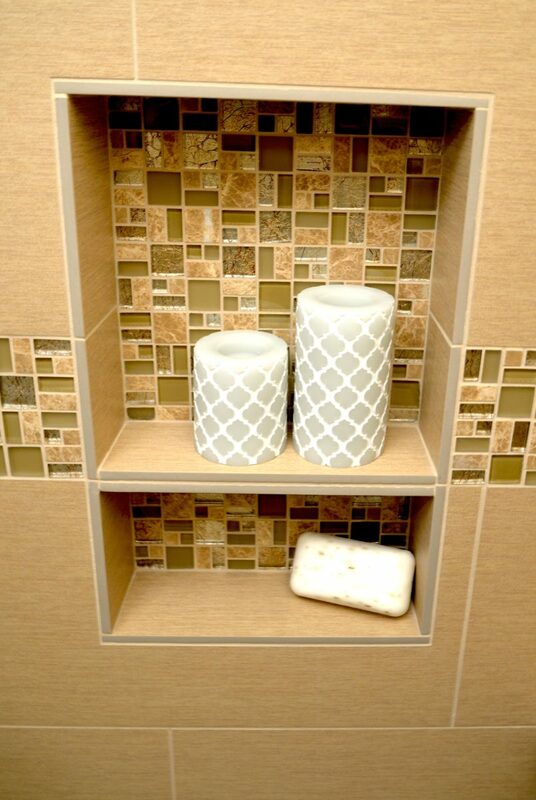 Also try our Floating Shelf™, a tile ready shelf for use with any Recess-It® niche units. Recess-It® niche products are manufactured in the U.S.A.
Not in the USA? Be sure to check our list of Canadian distributors and online sales distributors. 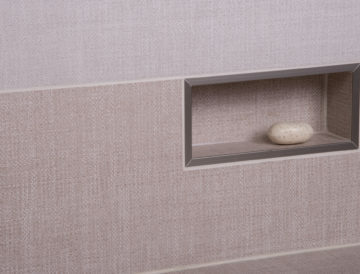 REC 1414 Recess-It Square (4) Wall fasteners supplied and features rolled flange for any style trim use Face = 13 1/4"x13 1/4" Back = 12 3/4"x12 3/4" Depth = 3 7/8"
REC 614 Recess-It Rectangle (4) Wall fasteners supplied and features rolled flange for any style trim use Face = 6 1/4"x13 1/4" Back = 5 3/4"x12 3/4" Depth = 3 7/8"
REC 1418 Recess-It Rectangle (6) Wall fasteners supplied and features rolled flange for any style trim use Face = 13 1/4"x17 1/4" Back = 12 3/4"x16 3/4" Depth = 3 7/8"
REC 46 Recess-It Rectangle (4) Wall fasteners supplied and features rolled flange for any style trim use Face = 6 1/4"x4 3/4" Back = 5 3/4"x4" Depth = 3 7/8"
REC1422 Recess-It Rectangle (6) Wall fasteners supplied and features rolled flange for any style trim use. 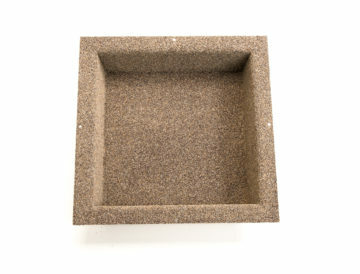 Floating shelf included Face =13 1/4" x 21 1/4" Back =12 3/4"x20 3/4" Depth =3 7/8"
Won’t the flange cause a bump in the tile? 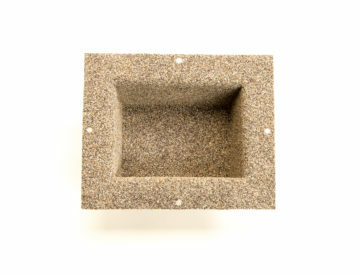 The waterproofing flange is an important element that is unique to the Recess-It product line. 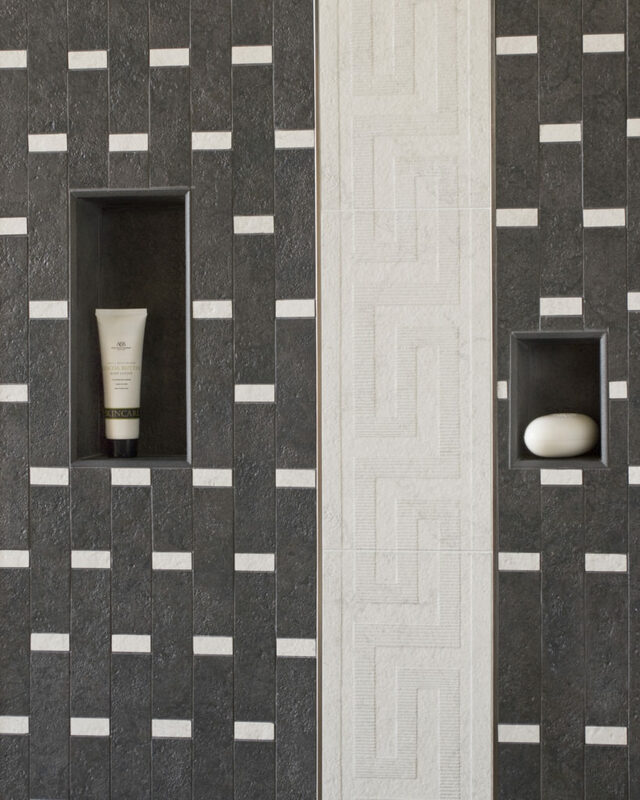 It serves as important role in maintaining the waterproofing integrity of the wall. It is approximately 1/16th of an inch in thickness. It may cause a “bump” issue if not addressed properly. there are two basic methods available to minimize the thickness of the flange. 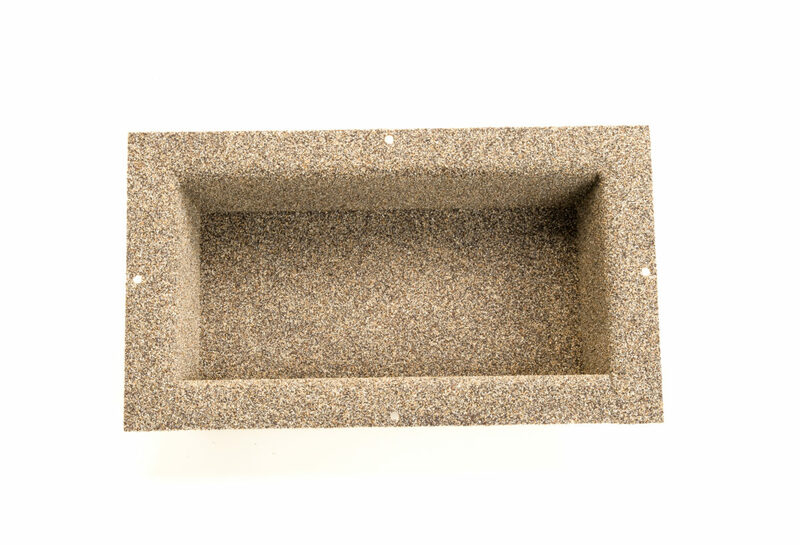 You can simply “feather” the edge of the Recess-It unit for a width of 8-10 inches by using the bonding material (thin-set/mastic) of the project and the smooth side of the trowel. 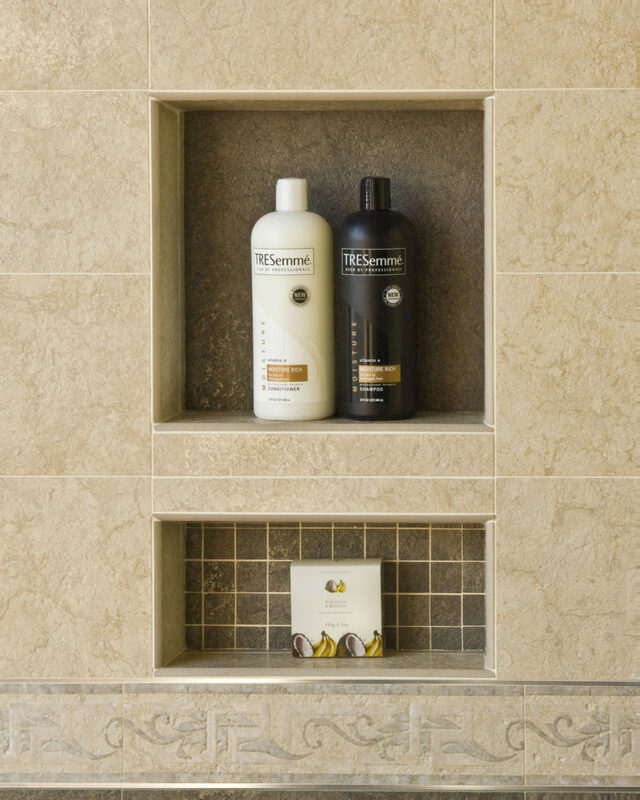 Spread the bonding material around the entire perimeter of the unit after installation and allow to skin prior to setting tile. 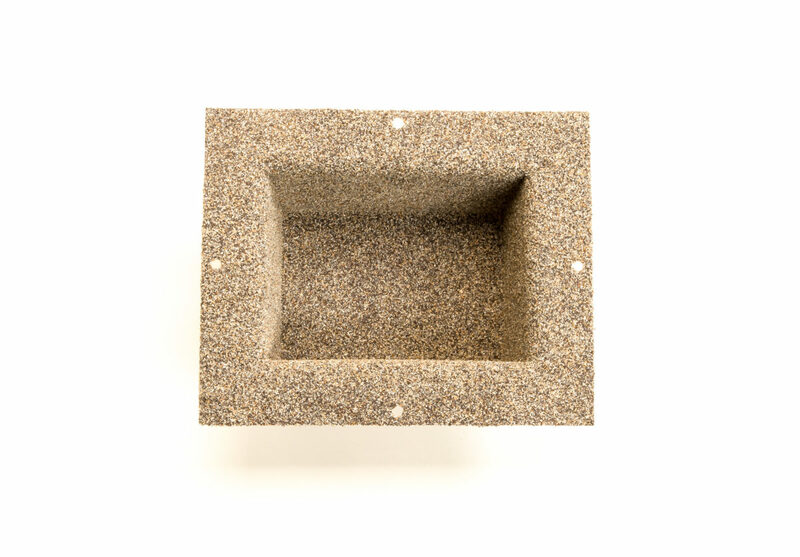 If you are using a cementitious based substrate, you may flush set the unit by grinding down the substrate 1/16″ for the full width of the flange, prior to placement. 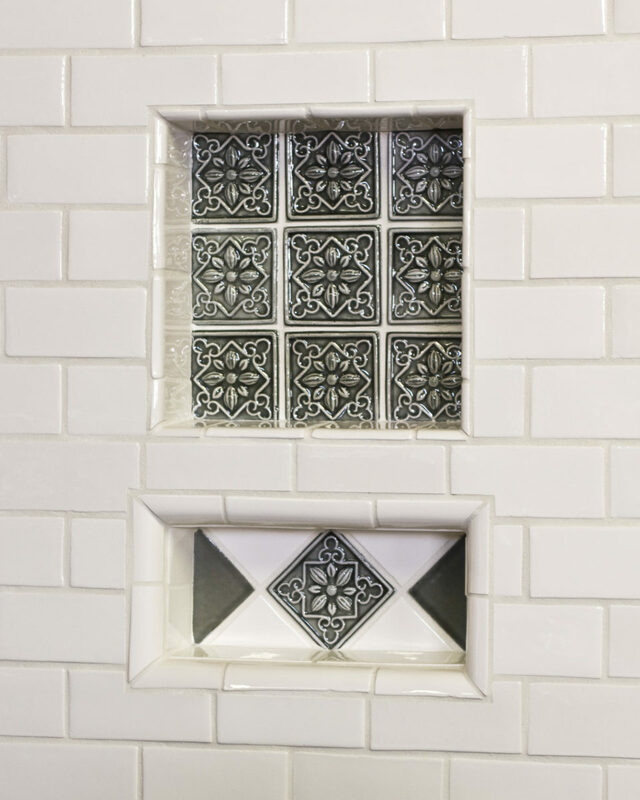 If you are installing in fresh laid mortar, place the bead of caulk on the back of the mounting flange and just press the unit into the mortar before it sets completely. Do I have to install horizontal blocking? No, it is not required to install horizontal blocking. The aluminum shell is structural and the supplied screws are designed to pull the substrate snug against the back of the flange. 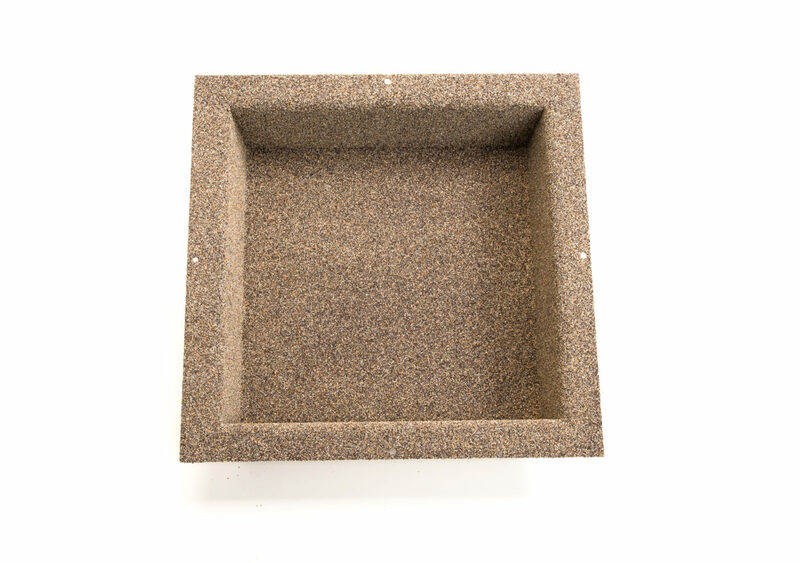 You may easily add horizontal, if desired, by placing the blocking after the cut out for the Recess-It unit has been made. 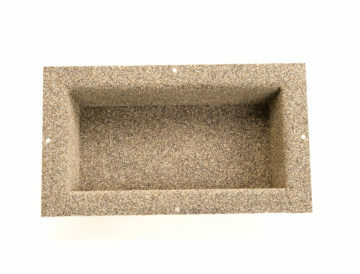 Secure each block in place with two (2) galvanized countersunk screws (1- 5/8 gypsum screws work great!) placed at each end of the cut out, under the mounting flange. The screws locations will then be covered and waterproofed by the mounting flange after the final unit placement. The bottom slope seems excessive. Why is that? 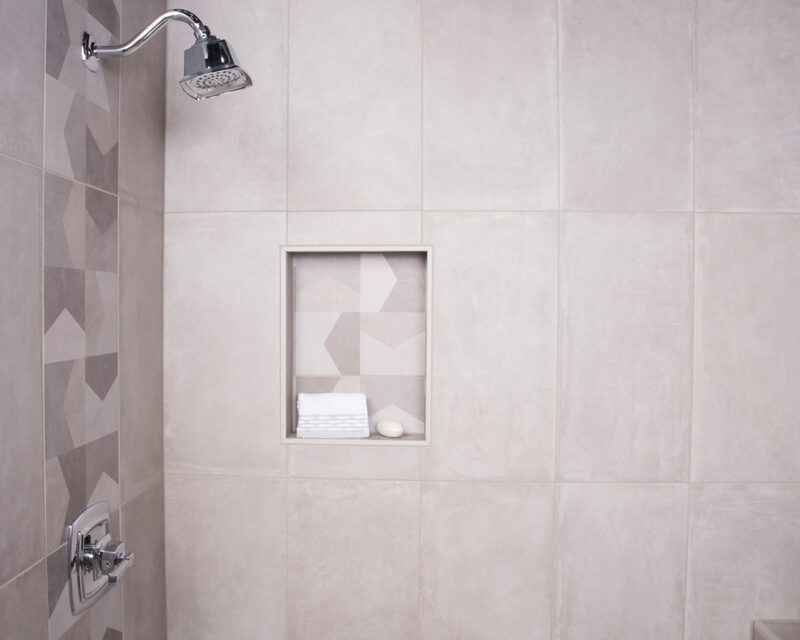 Recess-It products have a preset slope to ensure that any grout penetrating moisture can not be retained inside the unit and cause mold and/or mildew development. 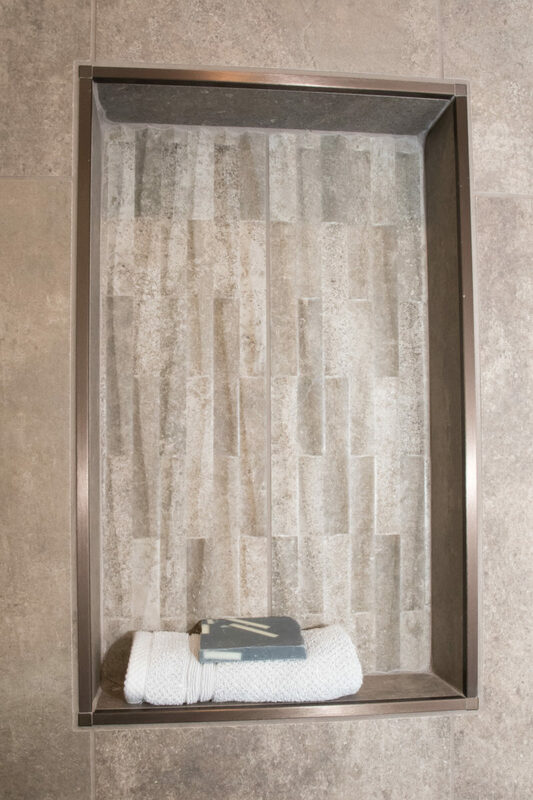 The slope can actually be minimized by building up the thin-set or mastic thicker in the front to accommodate your specific installation need. Remember not to adjust the slope to the degree that it slopes to the rear of the unit! You mention using caulk. Why? 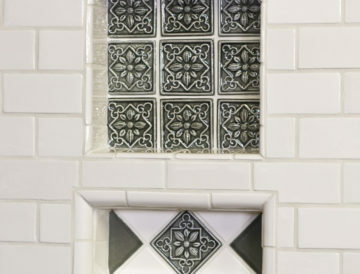 A bead of caulk must be installed on the back of the mounting flange prior to unit placement. Any caulk may be used for this purpose since it is merely to act as a waterproofing gasket between the substrate and the unit. Are Recess-It units waterproof? Do I need additional vapor barriers or waterproofing membranes? Recess-It units are made of a structural, alloyed aluminum shell with a sprayed on elastomeric/waterproofing coating. 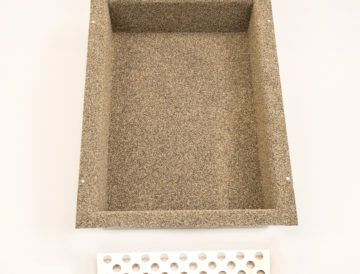 The shell backing eliminates the possibility of membrane penetration, and the units vertical mounting with positive sloped bottom ensures no damming of water inside the unit, causing any potential for leakage! 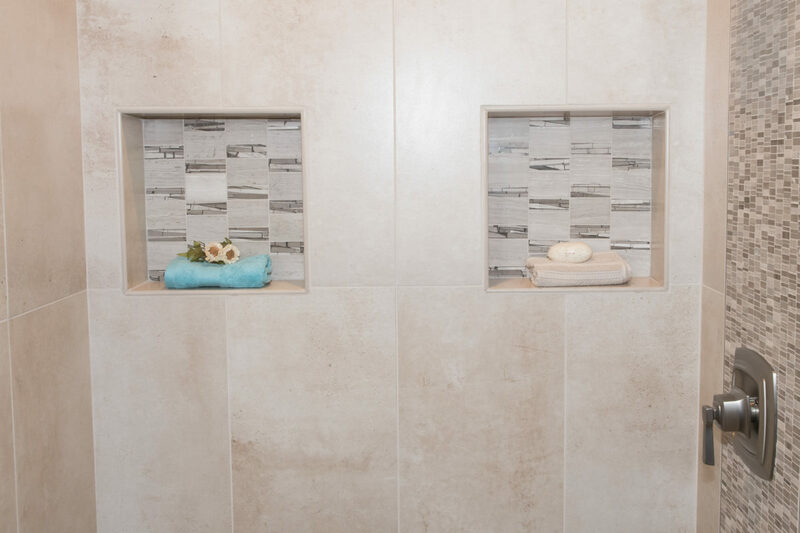 The variation of temperature between the air trapped in the wall cavity and the water from the shower head can cause condensation to develop where the temperature clash meets a solid surface or barrier such as waterproofing membranes or non-breathable surfaces. 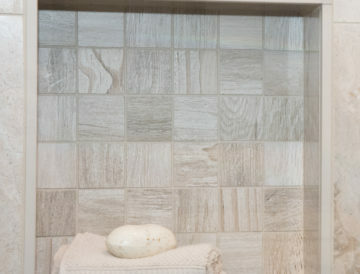 The unique design of the Recess-It units allow it to be installed without any direct wood to unit contact, thus eliminating any moisture buildup which can destroy the wood framing of the wall over a period of time. The preset slope on the top and bottom of the Recess-It is also designed to route any possible condensation buildup on the shell to the lower front flange and away from fungus susceptible wood members, either by direct contact or “drip-off”. 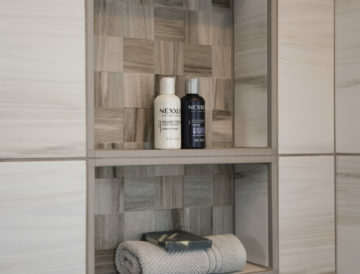 What is the Floating Shelf? 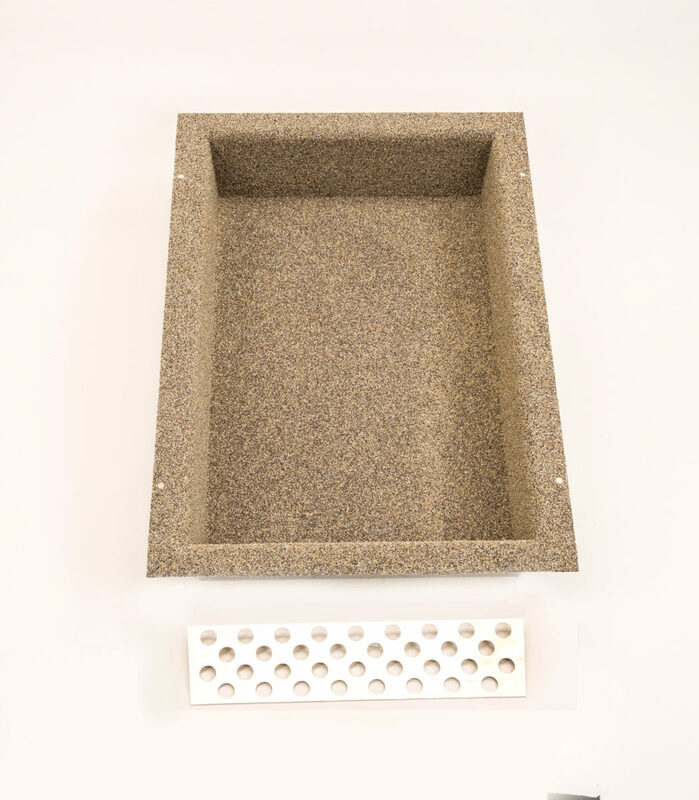 The Floating Shelf is a 1/16th inch thick aluminum reinforcing unit, which is completely perforated with 1/2″ holes. 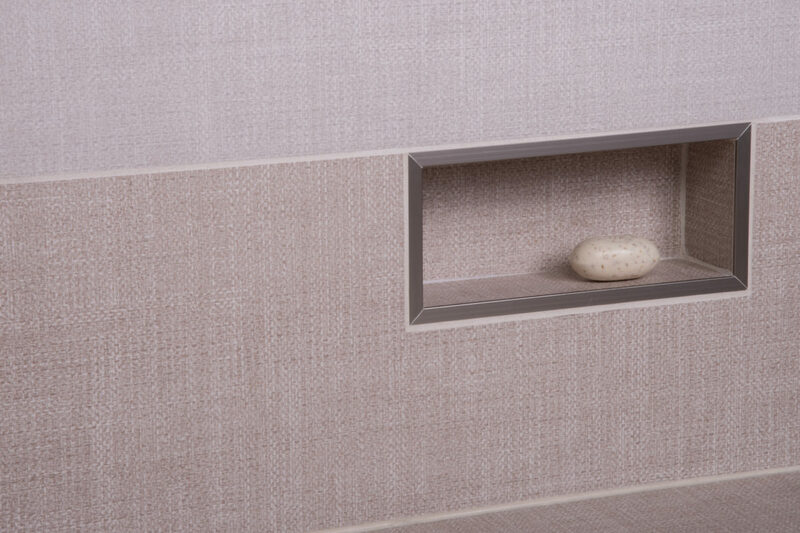 The shelf, when combined with surfacing tiles on top and bottom and grout, provides a structurally reinforced tiled shelf at the desired location inside the Recess-It niche. 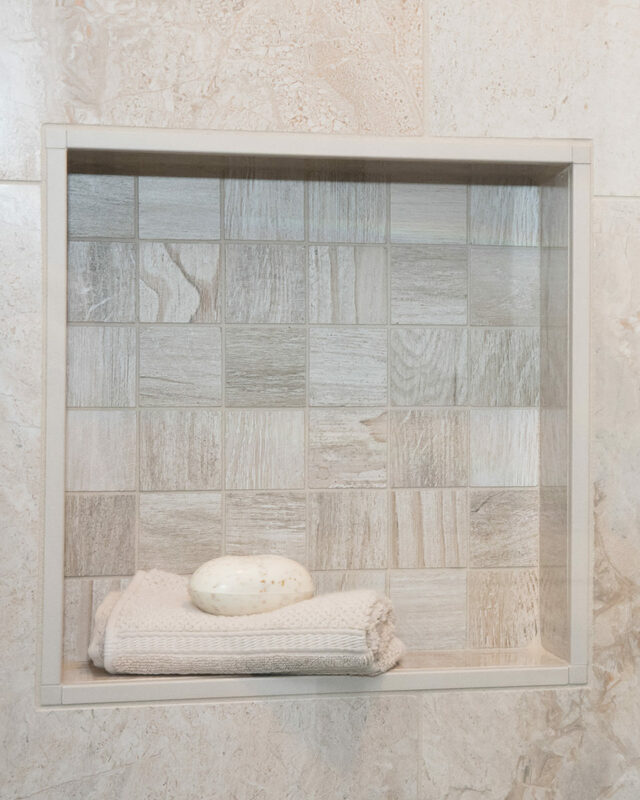 The Floating Shelf unit is sized to fit within the grout joint of the vertical wall tile placed inside the Recess-It unit. 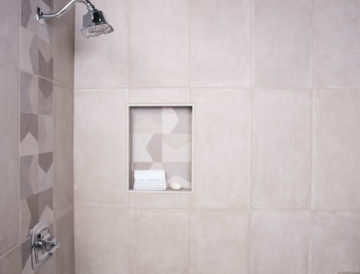 This allows the installer to align the shelf with the existing layout of the wall tile without compromise, time consuming tile cutes, or layout issues. 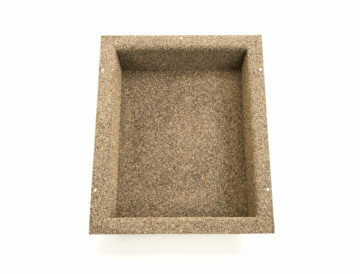 The Floating Shelf unit may be used with any Recess-It unit! 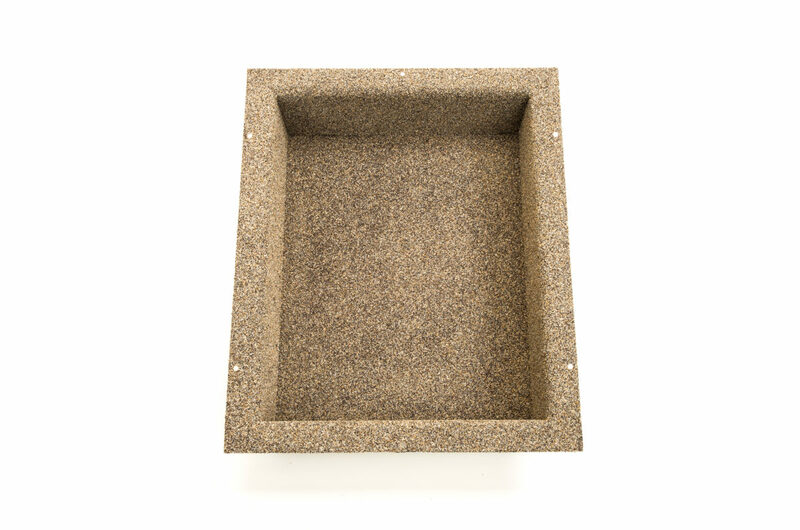 It can even be used in the 614 when mounted vertically (ideal for a leg shaving foot rest), by easily cutting the shelf to fit! 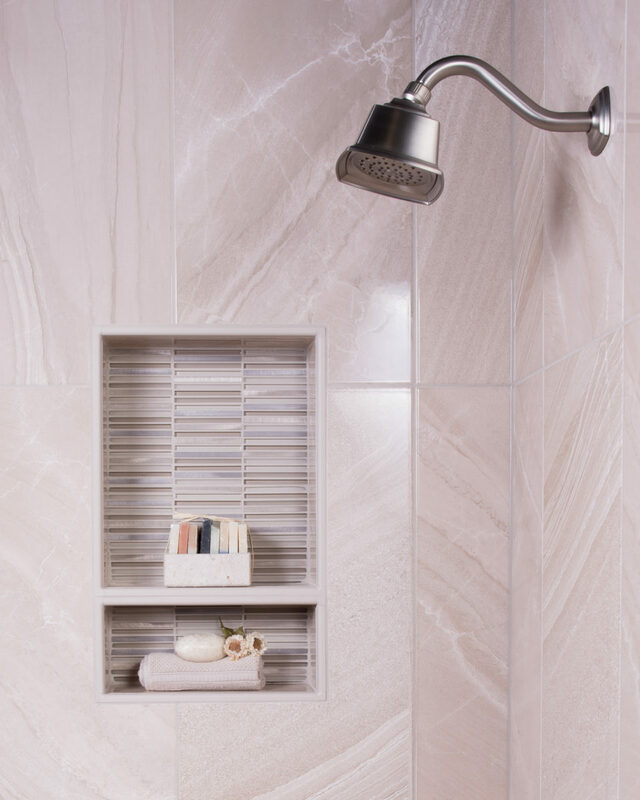 How do I bond tile to the shelf? 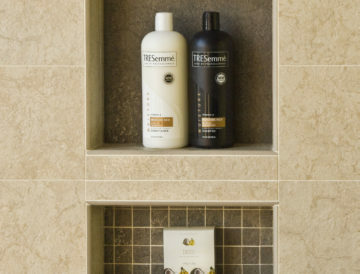 Standard thin-set or mastic is used to bond the tiles to each other rather than directly to the shelf. 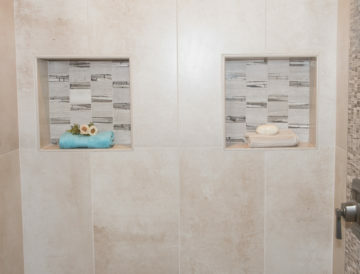 The 1/2″ holes allow the bonding material from the tiles on one side to penetrate the shelf and bond directly to the tiles on the other side of the shelf. 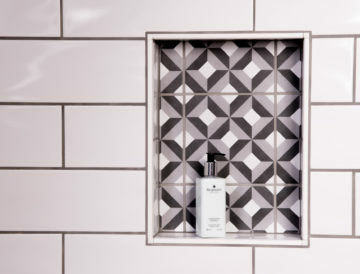 This effectively causes the shelf to be “sandwiched” between the tiles which then acts as the reinforcing layer of the shelf once the grout completes the installation. 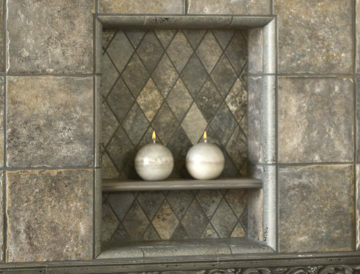 What type of tile do I use on the shelf? 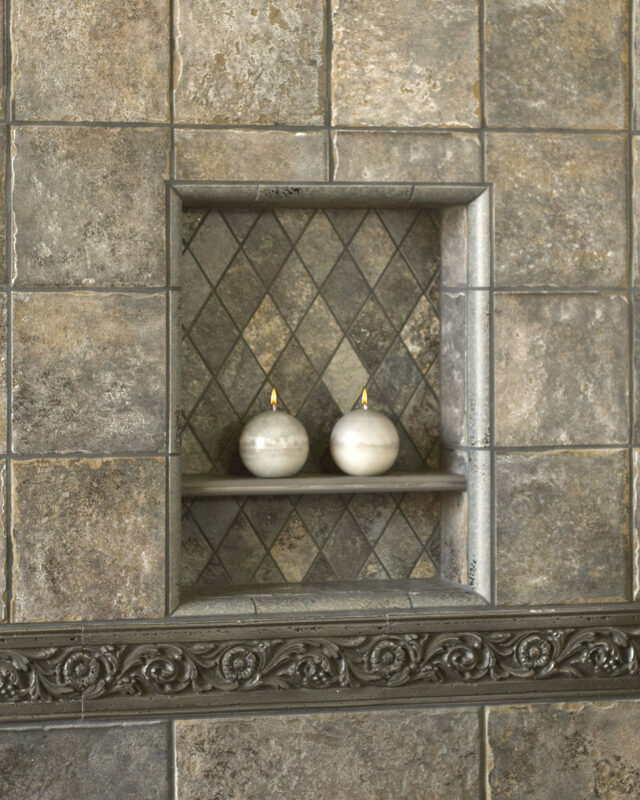 The easiest and most preferred trim tile for the shelf is “SBN” or surface bullnose tile. 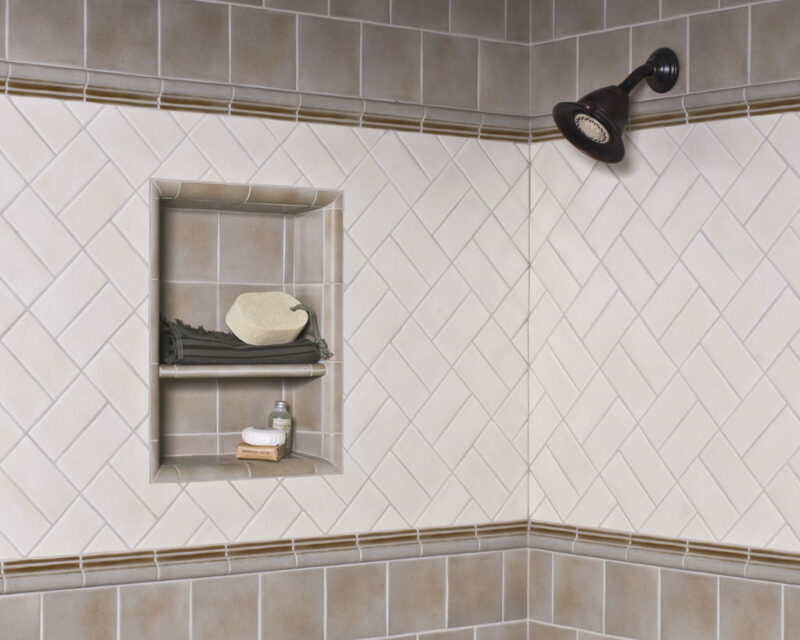 Many tile lines do not include SBN tile as a part of their standard trim selection. 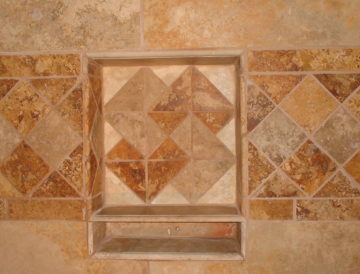 In these instances, you may choose to “back cut” the field tiles on a 45″ and use a 1/4″ round trim piece for the front edge. 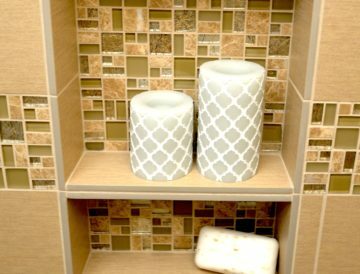 Another method you might consider is to thicken the shelf with a piece of cement board substrate material and use a coordinating accent tile across the front. Can I place the Floating Shelf in position other than existing grout joints? 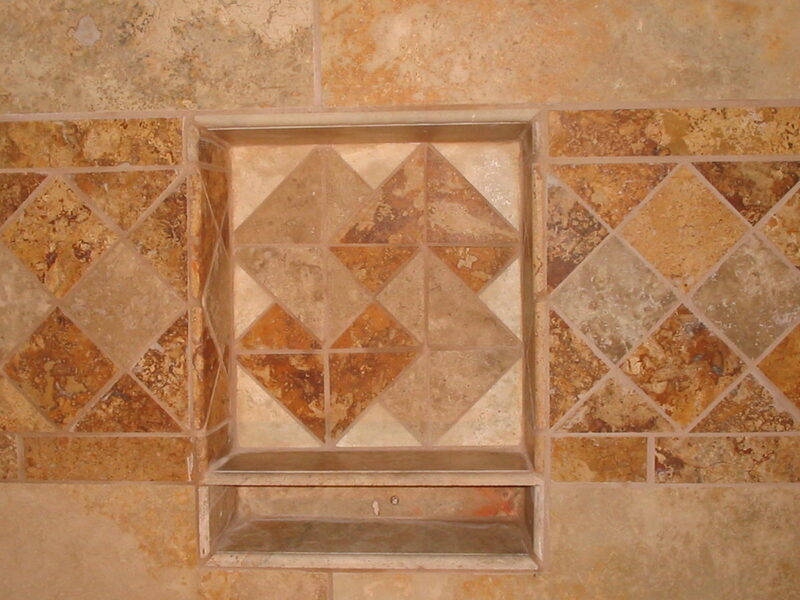 This may be accomplished by cutting the tiles inside the Recess-It unit where you wish to place the shelf. 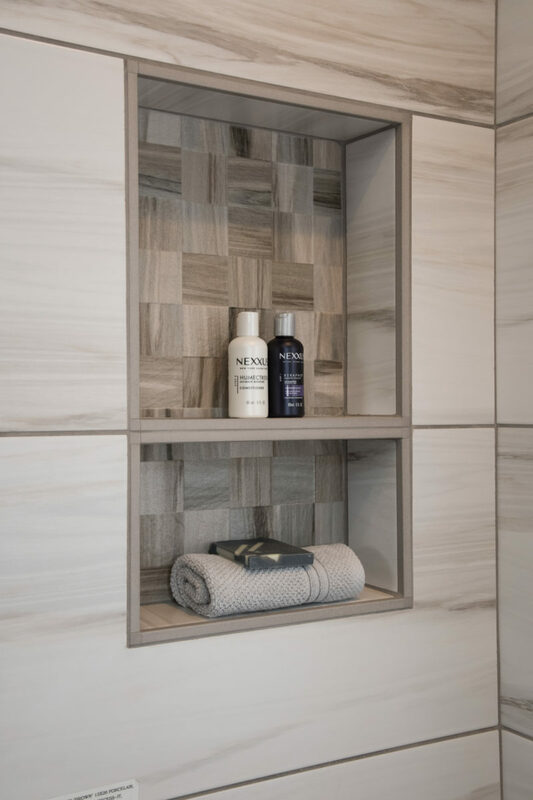 A wet saw is best for this purpose since the thickness of the blade will cut a joint through the tile to receive the floating shelf, without causing the tile lines to move up the distance of the shelf material. Is the Floating Shelf strong enough to support anything? 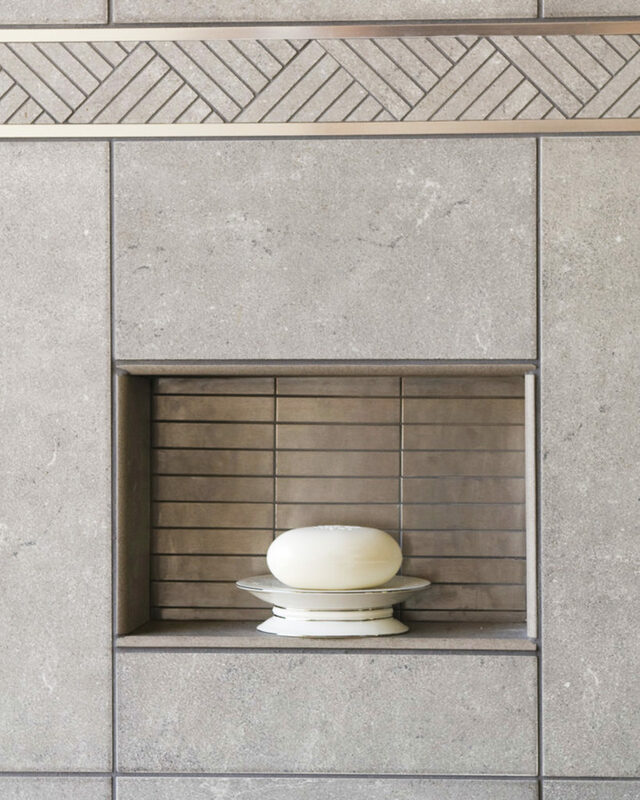 If you have only just tiled the unit, it will feel a bit flexible in the middle and may leave you wandering about what it can support. 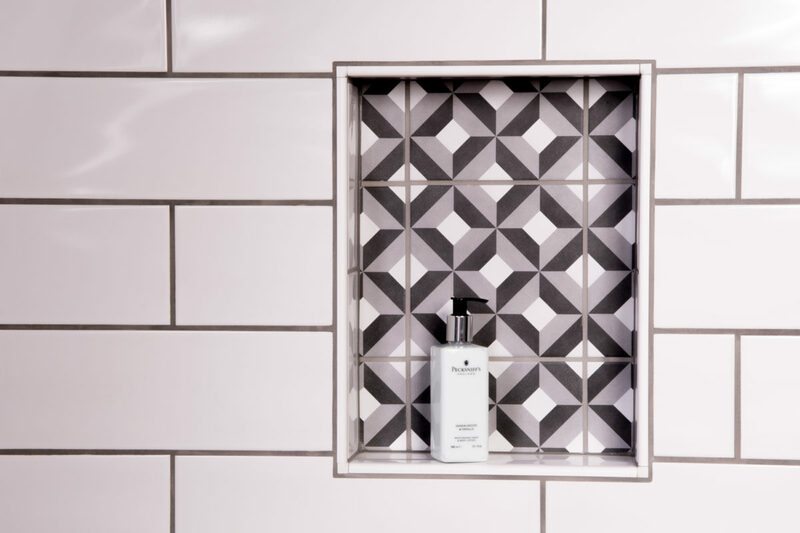 However, once the project has been fully grouted and allowed to reach its full cure (usually about 24 hours), it will be sufficient on strength to hold all standard toiletry items. 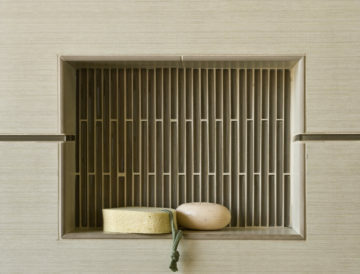 The grout also plays a key role in holding the shelf in its final position inside the Recess-It. 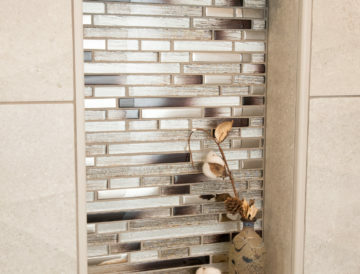 Be sure you check centering of the shelf during grouting to ensure final placement! 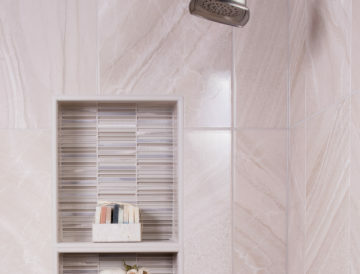 So many products for your shower installations: Better-Bench, Better Tray, Recess-It, Floating Shelf, Adjustable Bench, Invisabolt, Ledgeline. And they are manufactured in the USA.